This is a paleo, gluten free and diet friendly spin on Sweet n’ Sour chicken. And it tastes better than takeout. I got the idea for this recipe over at thedomesicman.com. He has a lot of great paleo takeout recipes and quite the knack for cooking. The sauce doesn’t use ketchup as a base and the breading technique for the chicken can be applied to a wide variety of different dishes. Like kid friendly chicken nuggets! Let’s get started. In a saucepan or skillet, combine the sauce ingredients. Medium heat until bubbling then low to summer. Letting the sauce ingredients simmer as you cook the chicken will help to combine and strengthen the flavor. The sauce should reduce to a tomato soup like consistency. Add more chicken broth if it gets too thick. Stir occasionally. Cube the chicken. *For extra tender chicken, brine in 1/2 cup water with 1 tbsp kosher salt for 1 – 5 hours, drain and pat dry before using. For extra flavor marinate in dill pickle juice. Ideally Bubbies salt-brined, probiotic dills made without any added vinegar or junk. Preheat oven to 250 for keeping the chicken warm between batches. Simmer that sauuuuce. In wok or skillet, heat a giant glop of coconut oil. You want the oil to cover the chicken about half way. Continue to add more as the level drops during cooking. Prepped. Good time to start the rice. I like to rinse it first to take away some of the extra starch on the outside. Makes it less sticky. 1 cup of Jasmine rice, 1 1/2 cup water, tbsp butter. Bring to a boil. Then cover and reduce heat to simmer. Cook 15 min. Off heat (lid on) and let steam for 10 minutes before fluffing with a fork. 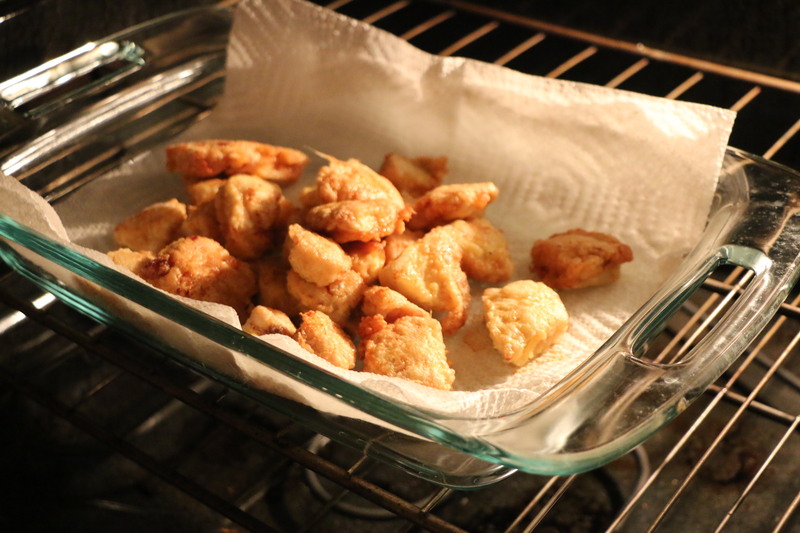 Toss the chicken pieces with 1/2 cup arrowroot starch and 1 tsp each salt and pepper. Dip coated chicken in egg with fingers. Shake off any excess egg and add to hot oil. Careful not to over crowd the pan. Keep your heat medium to medium high. It should be hot enough to give a nice sizzle and brown the chicken but not too hot that you burn the egg batter before the chicken is cooked through. This is about ready to flip. About 6-8 minutes per batch. As you finish each batch place in the oven on paper towel lined plate or dish. Once the chicken is finished cooking, finish the sauce. The flavors should have married nicely, taste and add more salt or white pepper if needed. If it’s too dark or strong tasting add more chicken stock. The sauce should be about as thick as tomato soup with a sharp but not overwhelming flavor. In a small bowl, add 1 tbsp of arrowroot starch and a little cold water. Mix into a slurry. Raise the sauce temperature to medium; once bubbling, add the slurry and stir until thickened. As always, let me know how you liked this recipe! I would only improve on it by using cauliflower rice rather than white rice. So quick and easy to make, plus it’s super healthy and tasty. That’s an option! I love cauliflower rice. Thanks glen.